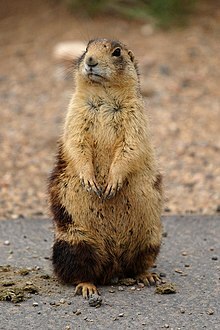 The Utah prairie dog (Cynomys parvidens) is the smallest species of prairie dog, a member of the squirrel family of rodents native to the south central steppes of the US state of Utah. The fur is multicolor, which consists of black, brown, and dark brown at the tip. Face have dark brown cheeks and whitish tone of chins and mouth. The total body length of typical adult ranges from 30.5 cm to 36.0 cm with 3 cm to 6 cm of tail. Adult prairie dogs weigh about 0.77 kg to 1.41 kg in males, and 0.64 kg to 1.13 kg in females. Utah prairie dogs show sexual dimorphism that males are 27% bigger than female, although the ratio varies by season. In 1952, Durant noted that Utah prairie dogs have larger in every aspect of skull than that of Gunnison's prairie dog. Utah prairie dogs prefer swale land area with abundant herbaceous plants. They build burrows on soils with adequate drain ability, and depth to protect themselves from predators and other environmental factors such as temperature. Utah prairie dogs are only found in the southern part of Utah; today they are only found in the central and southwestern part of Utah in Beaver, Garfield, Iron, Kane, Piute, Sevier, and Wayne Counties. However, it was recorded that Utah prairie dogs existed as far north as Nephi, and south to Bryce Canyon National Park, and Aquarius Plateau to the east in 1920, but the number declined from the 1920s to 1970s by 87%, and this was thought due to human settlers who caused overgrazing of soil, thus catalyzed the invasion of shrub to the grass land. Utah prairie dogs are mainly herbivores, but they sometimes choose small insects also, such as cicadas. and highly prefer grasses but they do consume flowers in shrubs. Utah prairie dogs choose only few species of grasses only that are native to the soil. Utah prairie dog shows polyandry behavior, and lays only one litter per year, which generally consists of 1 to 8 litter size. The breeding occurs generally from mid-March through early April. They build extensive "towns" of underground tunnels and chambers, each town composed of a population of members of an extended prairie dog family group called “clan”, and they forage from dawn to dusk. The species appears in the IUCN Red List of Threatened Species, with a status of Endangered, last assessed in 2008. The Utah prairie dog is listed as a threatened species by the United States Fish and Wildlife Service. In 1972, studies estimated a population of 3,300 Utah prairie dogs in 37 colonies. Studies by the Utah Division of Wildlife Resources in spring 2004 reported 4,022 Utah prairie dogs, a number believed to reflect half of the total current population. The Utah prairie dog can do significant damage to farms by digging holes and eating crops, drawing the ire of Utah farmers, who have used poison liberally to destroy the animal. This is a major reason for the population decline, though there are other factors, such as "land development, deteriorating rangeland health, the encroachment of woody vegetation, sylvatic plague, and drought." Conservation efforts include encouraging landowners to improve the health of their rangelands, and compensating farmers who set aside areas the prairie dogs may use. ^ a b Linzey, A. V.; Rosmarino, N.; Willson, K.; Roth, E.; Hammerson, G. (NatureServe) & Cannings, S. (NatureServe) (2008). "Cynomys parvidens". The IUCN Red List of Threatened Species. IUCN. 2008: e.T6090A12420124. doi:10.2305/IUCN.UK.2008.RLTS.T6090A12420124.en. Retrieved 13 January 2018. ^ Wright-Smith, M.A. 1978. The ecology and social organization of Cynomys parvidens (Utah prairie dog) in south central Utah. M.A. Thesis, Indiana University, Bloomington. 44 pp. ^ Durrant, S. D. 1952. Mammals of Utah. Univ. Kansas Publ., Mus. Nat. Hist., 6:1-549. ^ Template:Collier, G.D. 1975. 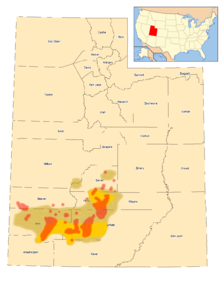 "The Utah prairie dog: Abundance, distribution, and habitat requirements". Pub. No. 75-10. Utah Division of Wildlife Resources, Salt Lake City, UT. 94 pp. ^ a b Template:McDonald, K.P. 1993. Analysis of the Utah prairie dog recovery program, 1972-1992. Publication No. 93-16. Utah Division of Wildlife Resources, Cedar City, UT. 81 pp. ^ a b Hoogland, J. L. 2003a. Black-tailed prairie dog: Cynomys ludovicianus and allies. Pp. 232–247 in Wild mammals of North America (G. A. Feldhamer, B. C. Thompson, and J. A. Chapman, eds.). Johns Hopkins University Press, Baltimore, Maryland. ^ a b Hoogland, J. L. 2013. Why do female prairie dogs copulate with more than one male?—Insights from long-term research. Journal of Mammalogy, 94(4), 731-744. ^ "Utah prairie dog". Mountain-Prairie Region Species Website. U.S. Fish and Wildlife Service. Archived from the original on 26 September 2006. Retrieved 4 January 2013. ^ a b "Economic Incentives Can Save The Threatened Utah Prairie Dog". Environmental Defense Fund. Wikimedia Commons has media related to Cynomys parvidens. This page was last edited on 30 October 2018, at 00:58 (UTC).